Most of the time the major prerequisite for a successful event is the capacity of the venue to create a connection between the place and the concept of the event. Scenography, accommodation capacity, circulation of people and multiple functional aspects need to be perfectly attuned. Professional event requires adapting the infrastructure for the occasion, which can be impeded by time and budget constraints. Reception, product launch, street marketing, showroom, exhibition, catwalk, well-being space, VIP lounge, shooting stage, restaurant, bar, cocktail party, soirée, special occasion, meeting, conference, incentive, team building and temporary accommodation allowing to adapt the capacity of the site to the number of guests. Arranging the reception space to correspond the scenography and disposition of functional zones, spotlighting the essence of the event becomes a child’s game! The event space created will playfully direct the eye and guide the guests in a natural manner, at the same time hiding the backstage or performing other functions required by the site. Add illumination, games of light and shade, acoustic and olfactory effects to create a unique and refined ambiance fascinating the guests. Many works on the spherical architecture highlight its universal quality to give the sense of peace and well-being to people. Inside the Bubble, the protective and maternal aspects of this cocoon allow the guests to feel the place. A unique acoustics emphasizes the convivial atmosphere. The spherical form of the Bubbles and the materials they are made from quiet exterior noises and send to the center the sounds produced inside. 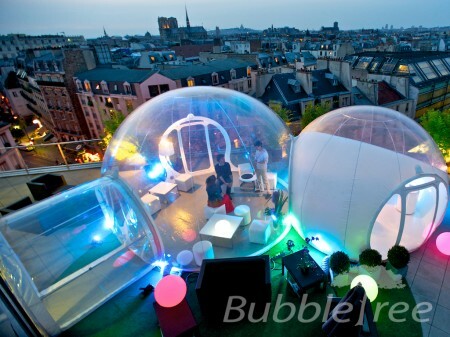 The frameless ephemeral Bubbles enchant their guests. 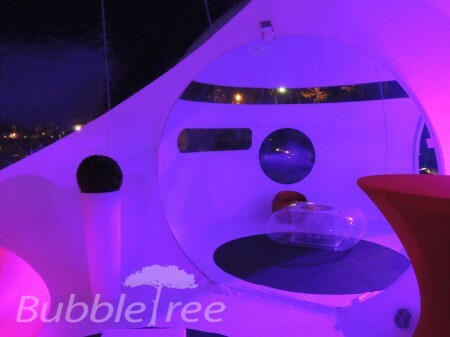 BubbleTree Event offers you a unique means to naturally fuse together luxe, extravagancy, conviviality and magic in one place.